We saw that a routed event in WPF can be routed up or down the logical and visual trees, being seen by any element in the hierarchy that chooses to handle the event. 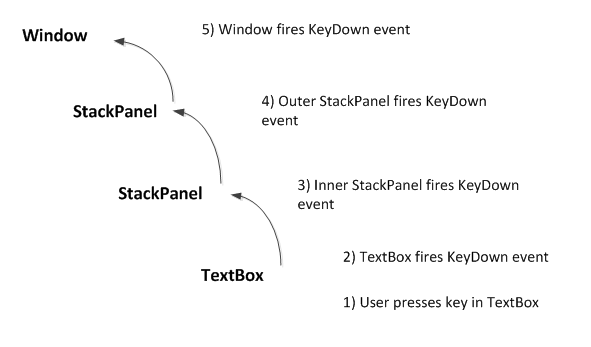 In the diagram below, a KeyDown event is routed up the tree. Any of the event handlers that intercept this event can choose to indicate that they have handled the event, by setting the Handled property of the KeyEventArgs argument to true. When this happens, the event will not continue propagating up (or down) the tree.